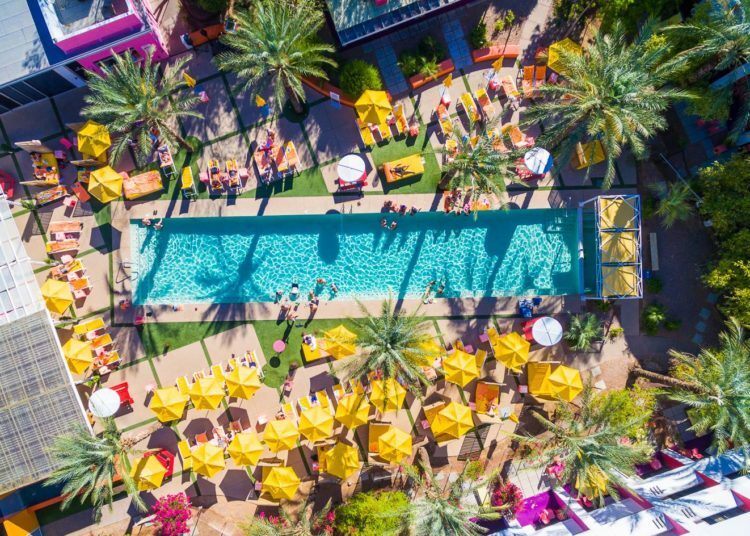 Triple digit temperatures, cool vibes and an electric scene make these five hotels the ultimate spot for a day at the pool. But not just any day at the pool. These hot spots hit the high mark for live DJs, weekend pool bashes, cool cocktails and a serious where-to-be-seen atmosphere. So find your chicest shades and head out to one of these five hotels where the party meets the pool all summer long. 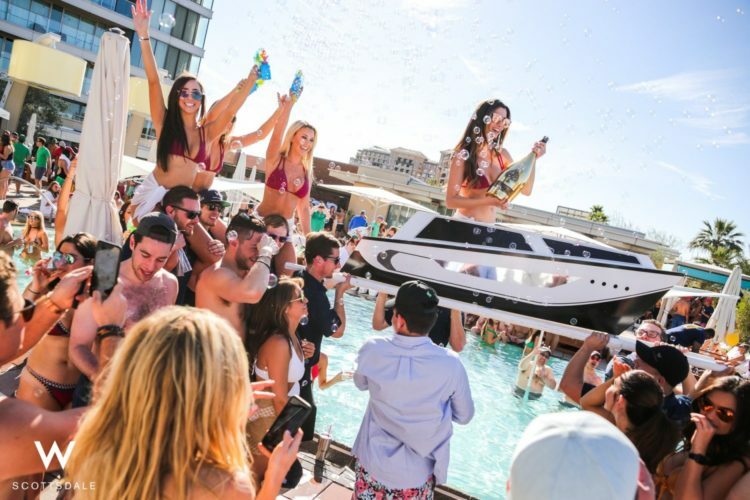 Bask in the summer sun in the heart of Old Town at W Scottsdale where they’re hosting their WET Weekends every Friday, Saturday and Sunday now through the end of summer. And by summer, we mean early fall because it’s Arizona after all! Lounge poolside and sip on cocktails while DJs spin beats from 12 to 6 p.m. Reserve one of the 11 private cabanas or sprawl out on a daybed while enjoying views from the second floor oasis. For non-hotel guests, there is a cover fee that usually starts at $20. This year’s Best of Our Valley winner for Best Pool Party, Hotel Valley Ho’s Oh Pool is where you can let loose under the Arizona sun March through October. Visit on the weekend for Session Saturdays and Recovery Sundays which feature live DJ entertainment from 1:30 to 5:30 p.m. or top off your week with Frosé Fridays for rosé starting at $9 per glass and Chandon Rosé Frosé for $12. On Mondays and Tuesdays guests can snack on half-off food and sip on $6 cocktails. Don’t miss this year’s Cinco de Mayo fiesta hosted by Don Julio with $8 cocktails and free tacos for the first 50 guests plus a DJ from 1:30 to 5:30 p.m. Step up your experience any day with the rental of a colorful cabana (snacks included!) or a spacious daybed. 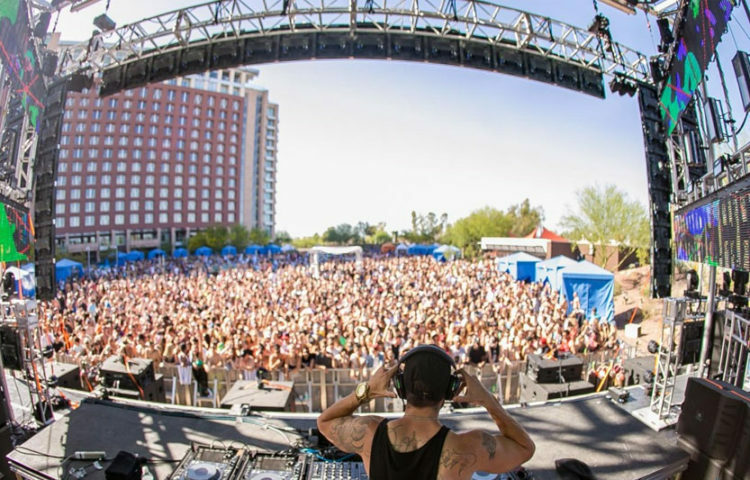 Splash your way through summer at Talking Stick Resort for the return of its Release pool party series. The series takes place at the main pool every Saturday and some Sundays during holiday weekends from 12 to 6 p.m. and features live DJs and a wild scene. Past DJs have included Tiesto, Steve Aoki and more. The first party of the 2018 season will kick off on May 5 and feature Deorro, with Galantis, Kaskade and RL Grime scheduled for the rest of May. Kick off pool season with The Saguaro’s Cinco de Saguaro party on May 5, from 12 to 6 p.m. Sip on $12 Hornitos margaritas and $10 Micheladas or snack on three for $7 tacos while chilling out to “rhythm-driven desert vibes” from Arizona’s rising DJ talent. Pool parties are also scheduled for May 26, June 9 and 23. Stay tuned for the hotel’s full pool party schedule and DJ lineup releasing soon! 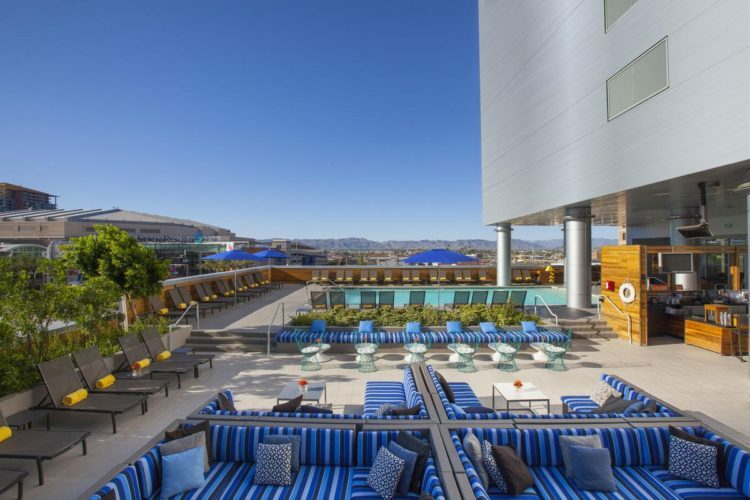 Take your pool party experience up high to LUSTRE Rooftop Bar at Hotel Palomar Phoenix, in the heart of downtown. The bar, which was named one of the best hotel rooftop bars by USA Today and Travel + Leisure, is bringing back its 100 Days of Summer series this year. From Memorial Day weekend through Labor Day, party-goers can hang poolside with events happening nearly every night of the week. For the partier in you, visit on Fridays for live DJs at 8 p.m. with different themes each week, and on Saturdays and Sundays, enjoy a classic Vitamin D-soaked pool party with sunny views of downtown. Plus, don’t miss holiday weekends (Memorial Day, July 4th and Labor Day) for even bigger bashes.